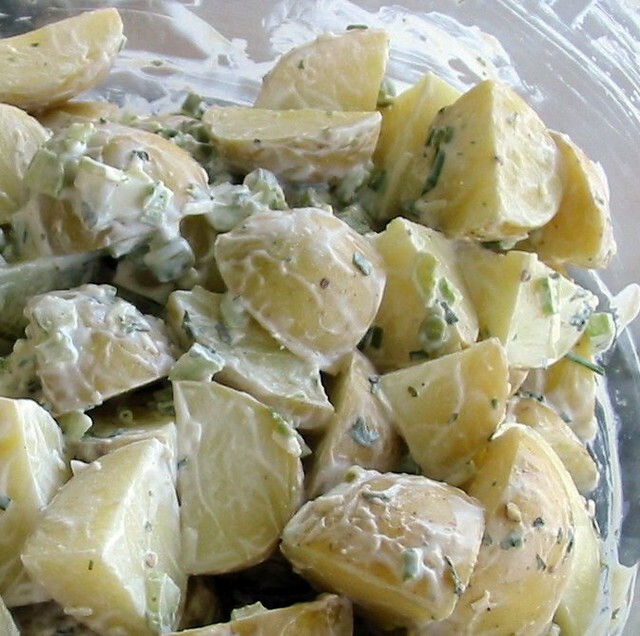 Potato salad is one of my favorite summertime dishes. Perfect for a barbecue or garden party, I love potato salad with baked beans and grilled hot dogs or cheeseburgers. Since we're using homemade lacto-fermented mayonnaise and fermented pickle relish, this recipe is good for your gut! Most of us these days have a lack of beneficial flora in our digestive tract. As a result, we get sick more often, suffer from food allergies, and we don't absorb the nutrients in our food as well as we should. The solution? More probiotic food! Like this potato salad. This recipe is legal on the GAPS diet — just leave out the bacon if you can't find bacon made without sugar. 1. Mix the egg yolks in blender or with whisk for 1-2 minutes. If using cold (not room temperature), mix a few minutes more. This is the key to mayonnaise that will set. If you use cold egg yolks, the mayo will not set unless they are warmed up in the blender (or whisked long enough in a warmed bowl). 2. Add the lemon juice (or vinegar), sea salt, and mustard. Mix for 30 seconds more. 3. With the blender running, add the olive oil drop by drop. When I say drop by drop, I mean drop by drop. Or at least a very thin, slow stream. This is the other very important element for making a mayo that will emulsify. If you go too fast, you'll end up with runny mayonnaise. 4. Once you've added about 1/2 a cup of oil, the sauce should have thickened into a heavy cream, and now you can add the olive oil in a thicker stream. Not too fast, though (especially if you are a beginner). If the mayo becomes too thick, add a few more drops of lemon juice or vinegar. 5. Blend in the whey. Spoon into a mason jar, cover with a lid, and leave it on the counter or in a cupboard (at room temperature) for several hours. Then transfer to the fridge. 1. Set the eggs in a saucepan covered with water. Turn up to high, bring to a boil, remove from heat and let boil for 15 minutes. Set aside to cool. 2. Fry the bacon, let cool, and chop or crumble. 3. Chop the onions & celery. 4. Peel the potatoes and cut into 1/2 inch thick slices. 5. Put the potato slices in a saucepan with water just to cover and 1 1/2 teaspoons of sea salt per quart of water. 6. Heat to a simmer, and cook the potatoes for about 5 minutes, or until just cooked through (don't overcook). 7. Immediately remove from the heat and drain the potatoes in a colander. 8. Transfer the potatoes to a large bowl. Stir in the apple cider vinegar with 1/3 cup of chicken stock and drizzle this over the potato pieces, turning them gently. Let sit for 10-15 minutes to absorb the liquid. 9. Peel the hardboiled eggs and slice thinly. 10. Add the onion, celery, bacon, pickle relish, hard-boiled eggs and season to taste. Top with 2/3 cup of mayonnaise and fold everything together until well blended. Taste the salad and add more salt, pepper, or mayonnaise as needed. 11. Cover the salad and set aside in the refrigerator for at least an hour or so before serving. It tastes even better the next day. This looks amazing! But I thought white potatoes weren’t allowed on GAPS due to their starch content. To make it Gaps legal, use steamed cauliflower….delicious and tastes like potatoes…. What’s your recipe for the pickle relish? I stay away from commercial mayo and don’t make my own, so I make potato salad with a dijon mustard vinaigrette. I use the kind of mustard with whole seeds in it. Yum. I’d love to try this. How long will lacto fermented mayo last in the fridge? Yum, going to make it with cauliflower! It’s such a waste of condiments if they are fermented! If you don’t make your own mayo (which I encourage you to try! I use grapeseed oil, pastured eggs and a whole grain dijon mustard and it’s outstanding! ), you can use sour cream – I buy Daisy brand. I can go to a farm in my state and buy milk, but the farmer is not allowed to process the milk in any way, so I can’t get butter or cream or cheese. Daisy is the only national brand that does not thicken, the only ingredient is cultured cream, and it tastes great, and it’s a lacto-fermented food.